If you have the feeling today that you are walking a balancing act within a relationship and not sure whether to stay or go think of all the hard work that has gone into the relationship so far, the foundations which have already been laid down and then decide whether you wish to fly away from this or tend to planting the seeds for further growth between the two of you. What you wish and hope for with the relationship can be accomplished and today is perhaps the perfect day to allow yourself to daydream of this as Venus (planet of love) comes into close contact with Neptune (planet of dreams). Let your imagination soar and perhaps the dove (of peace) will take you to places where you can “see” what you want next and manifest what needs to be done to accomplish this. Very nice card and such an awesome explanation of the card meaning! Thank you. 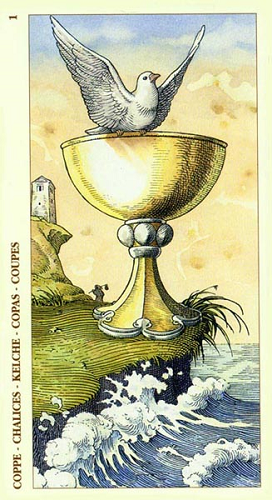 Yes… it was a different way of looking at the Ace of Cups as the imagery in this particular Ace of Cups was different to most packs. Glad it hit home for you and keep in mind you can have some cake… choose one specially for you because to nourish yourself and not give all the time to others is a way of replenishing your own reserves of self caring and self love which in turn gives back to others.